We offer Block Meals and Lyons Bucks for Faculty and Staff. Block Meals - These are meal swipes accepted at the newly renovated Chase Dining Hall where patrons enjoy all-you-care-to-eat offerings from several diverse action stations. Selections change daily, offerings are fully customizable, vegetarian selections abound and our Allergen Free Zone ensures each student will enjoy a hearty meal. Block Meals also allow for Lyons Swipe meals which are available at retail locations. 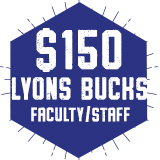 Lyons Bucks - These are declining balance dollars that may be used at any of our retail cafes including, The Hood Eco Café, Davis Spencer Café and Emerson Dining. 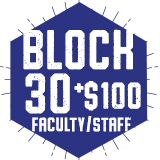 $300.00 Faculty & Staff Block 30 + $100 Add To Cart "Opens a dialog"
$195.00 Faculty & Staff Block 20 + $60 Add To Cart "Opens a dialog"
$135.00 Faculty & Staff Block 20 Add To Cart "Opens a dialog"
Use at Chase Dining Hall! $120.00 Faculty & Staff Block 10 + $50 Add To Cart "Opens a dialog"
$70.00 Faculty & Staff Block 10 Add To Cart "Opens a dialog"
$135.00 Faculty & Staff 150 Add To Cart "Opens a dialog"
$100.00 Faculty & Staff 110 Add To Cart "Opens a dialog"